Man-of-the-match Kyle Godwin impressed on his first start at fly-half, kicking 14 points. Jordan Lay and Bradley Davies were both sin-binned in the second half for the Ospreys, who could not add to Matthew Aubrey's earlier score as a difficult Six Nations block, which saw doubts emerge about the region's long-term future, ended in a crushing defeat. 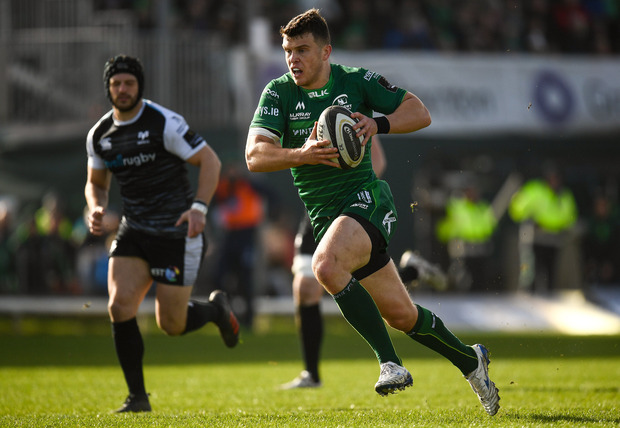 Connacht head coach Andy Friend demanded a big reaction from his side after last week's poor showing in Glasgow, and they were on the board within two minutes. Influential centre Peter Robb broke through midfield and linked with the supporting Marmion who deftly fed Farrell to run in his sixth PRO14 try of the season from 25 metres out. However, his clearance kick from the restart was charged down by Ospreys captain Olly Cracknell and scrum-half Aubrey gathered the loose ball to go over in the right corner. Godwin had a smashing solo try ruled out for obstruction by Colby Fainga'a back on halfway, but the scores kept coming for the westerners. Godwin's huge touchfinder led to a crooked Ospreys lineout and Marmion determinedly wrestled his way over via the five-metre scrum. Although a Cory Allen break and some scrum pressure had the visitors pressing for a late try, Tiernan O'Halloran's intercept launched Connacht downfield and Giles' deliberate knock-on - with three Connacht men waiting to convert an overlap - resulted in referee Marius Mitrea binning him and awarding a penalty try. Wales lock Davies' trip on Stephen Fitzgerald earned him 10 minutes in the bin, allowing Connacht to quickly set up the final try of the afternoon for McCartney.